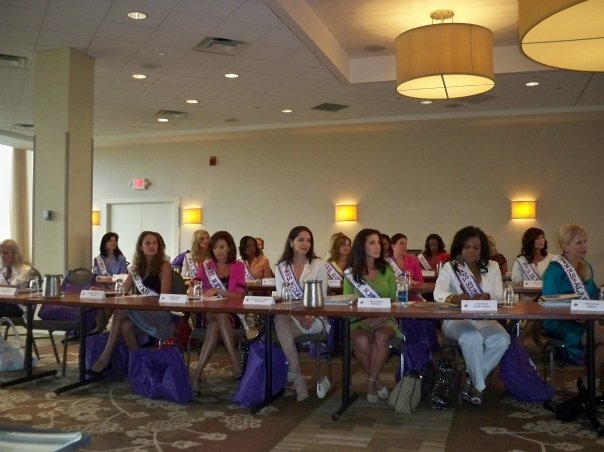 The Double Tree Hotel in Skokie, Illinois was the home for 48 Mrs. International contestants during the week of July 14th-19th. After check-in, Orientation began at 6:00pm and it was the beginning of a fantastic week. At Orientation, we received information about the week, introduced ourselves, and got a look at the program book for the preliminary and finals night. Our soon to be requiring queen, Laine Berry, Mrs. International 2008, inspired us to make the most of the week and cherish the new friendships we would make. Pictured with Eileen Townsend, Mrs. Kentucky and Randa Allen, Mrs. Midwest.